1. Make sure your kids SEE you writing. Point it out to them and explain your purpose when you make a list, write a thank you note/invitation, or create a plan for your next holiday. 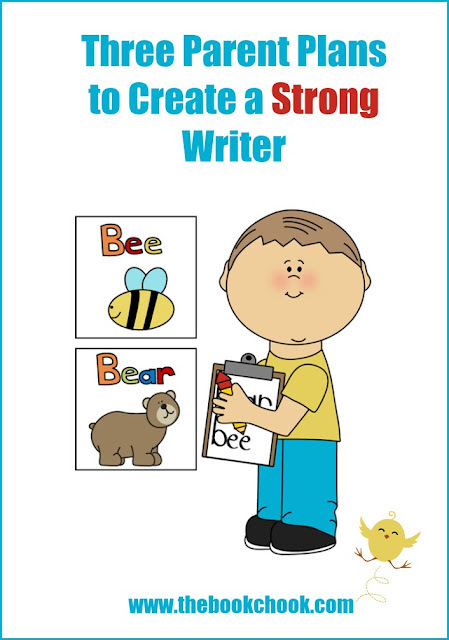 Encourage kids to join in when you write. Little ones could help by drawing a picture; older kids might spell out part of a word or write their own ideas. Participate as a family in events like Put a Poem in your Pocket Day and International Book Giving Day. Writing something as simple as a poem for your pocket or a hello card to accompany a book gift definitely counts as writing. 2. SET aside writing time on as many days as you can. Just like reading should be a daily habit, so too should writing. Think about when you can fit writing in so it becomes a natural part of your day. Do you keep a journal? Writing time! Would your kids like their own journals to write in - whatever they want? Do you make a list of groceries to buy perhaps? Writing time! Can your kids help with that list, jotting down items they know you need? (You may have to explain the difference between needs and wants!) Some writing may be on paper, some will be typing - kids should see and experience it all. 3. GRAB any excuse for writing. Just read a great book? Let’s write down its name so we can keep a record of great books. Loved that author? Let’s write down her name so we can see if the library has more books by her. Just made up a silly story? Let’s type it up so we can send it to Grandma. Need some funny jokes for when our friends come over? Let’s make a joke book and write out some of our favourites. Reading and writing go very well together - kids might like to make a list of silly characters or scary villains and draw them. When kids are just learning to read and write, it can be fun and useful to draw or take pictures of all their toys, then label them and make a little book. Tracing over or just sounding our the words is a great way to embed that word in our brains. The more we link writing as a natural extension of family activities and play, the more natural and habitual it becomes for kids. I believe natural and habitual writers grow into strong writers - and that’s cause for celebration! NB: The Book Chook will be cutting down on articles over the next several months while Susan is studying. From next week, you will mostly find one article each Wednesday, and mostly book and app reviews. The more usual program of articles -though only on Wednesdays and Fridays - about children’s literacy, literature and learning will probably recommence later in August. If you’re interested in encouraging kids to write, you might like to read Easy Ways Parents Can Encourage Kids to Write, Top Tips for Young Writers, and Nurturing Readers and Writers. Or check out my Listly list on Teaching Kids to Write, embedded below.